In Safari 11, Browsealoud speech does not work on some websites. This is because Apple have introduced a security setting that prevents webpages playing audio. 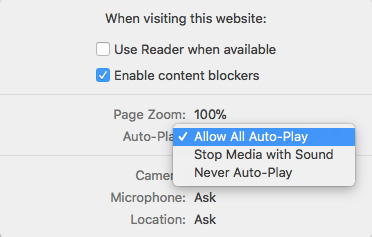 To fix this you have to change your Auto-Play settings in your Safari settings panel. You can either enable this for specific websites, or all websites. To enable Speech for a specific site. To enable Speech on all Sites. To enable Hover Highlighting in Browsealoud for all Websites, click on Safari at the top of your Window and select Preferences.